In addition to its range of superior products, Quikfix delivers superlative support services for governments, municipalities and highway authorities aimed at saving money whilst providing better, more efficient roads. We offer a complete Total RoadCare service to governments, municipalities, road authorities and multiple property owners such as airports, garage forecourts and supermarket car parks which includes surface repairs, line marking, signage and safety equipment. Total RoadCare is a single contract which takes care of all maintenance needs simply, quickly and economically ! For full details Contact us now. expertise of the Quikfix team is now available to clients everywhere seeking solutions and improvements to their highway network. As practitioners with a wealth of knowledge and skills wholly-focused on road design, construction and maintenance, Q Projects advise contractors, governments, municipalities and road authorities. For more information and every assistance Contact us now. road safety, reducing the tax burden by introducing toll roads and developing transport infrastructure ? 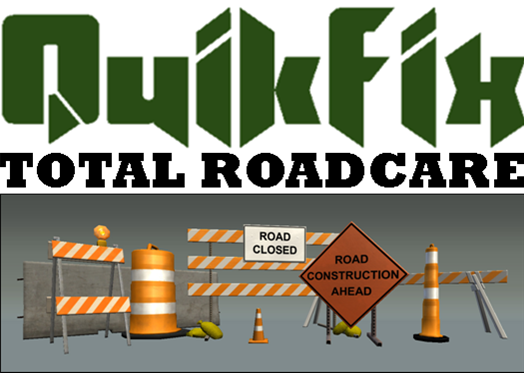 Quikfix is available to establish and provide a full-service Road Management Agency to better meet your needs. Our contract service is efficient, economical and accountable: find out how NOW ! RMA is also able to establish and deliver self-financing testing and licensing of vehicles and drivers, leading to safer roads and accident reduction. RMA is the driving force when it comes to innovative ways of managing and funding roads better. For full information and assistance Contact us now.